We feed our dogs an all natural, raw food diet. Please take the time to learn more about raw food and its benefits. If you have any additional questions, please don’t hesitate to contact us. If you are interested in purchasing raw food for your pet, see our price list for additional information. Feed your dogs and cats the way Mother Nature intended by eliminating grains and feeding them a BARF, Biologically Appropriate Raw Food, diet. 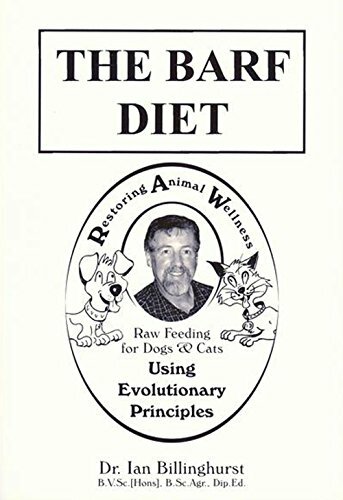 Australian veterinarian, Dr. Ian Billinghurst, long-time champion and international lecturer on the benefits and how-to of feeding raw foods to pets, explains in simple, understandable terms why and how to feed your animals for optimum health. Learn how to create simple, home-prepared meals that mimic the diet of your pets wild ancestors. You will no longer have to rely on mass-produced, often grain-based commercial foods that can compromise your pet s energy, health, even longevity.